If I’m being completely honest with you I would say that I’ve always believed down to be superior to synthetic fills in most situations. However, inspired by the recent release of Nemo’s new FeatherCore insulation which claims to be just as light and compressible as 650-fill power down I think it’s time to take a deep dive into a synthetic vs down sleeping bags. How are they different? How are they similar? Why might I want one over another? We’ve got all those answers and more within this post. It’s important for the serious two foot traveller to understand the ins and outs of insulation so they can make informed decisions about arguably THE most important piece of gear in the backpackers’ arsenal. So read on, and Let’s get to it. 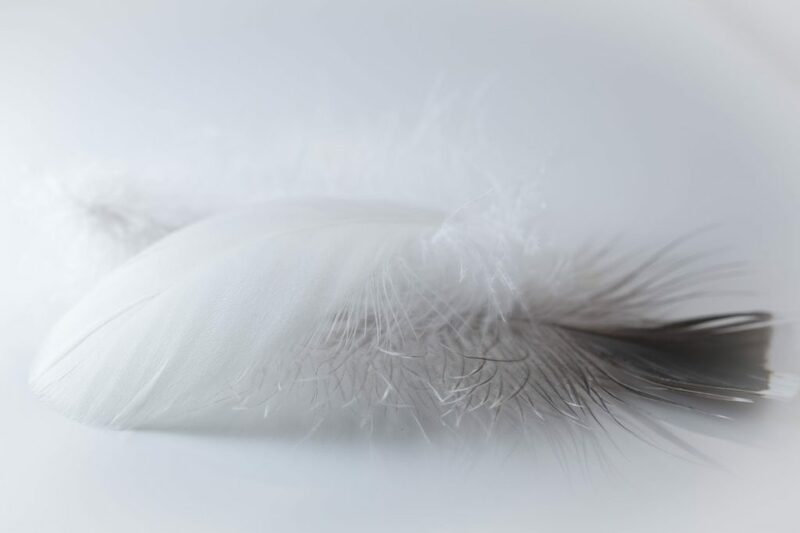 Down is a layer of fine feathers found underneath the harder exterior feathers of birds. It has been used by humans for centuries and held an important place in the culture of indigenous Americans. Nowadays’s it is used to fill sleeping bags, jackets, blankets, pillows, and other similar products. The down used commercially is most often duck or goose down. In some areas of the world, mainly Iceland and Scandinavia, people still collect down from wild eider ducks however most of the worlds down now comes from domestic geese. 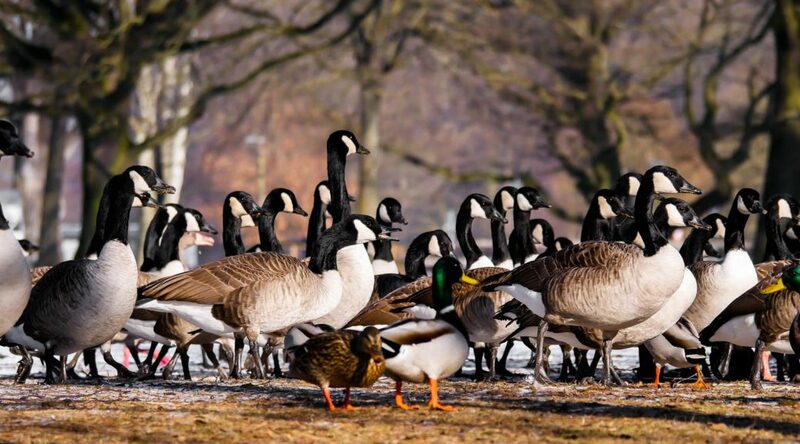 When buying down products, make sure to check that they are certified by the Responsible Down Standard (RDS) which ensures humane treatment of geese and ducks. Humans have tried to produce man-made materials that replicate the qualities of down. Fluffy down feathers trap air which makes it an excellent form of insulation. But, although we have developed many fabric materials that match down as far as warmth goes, something we have never been able to reproduce quite as effectively is the outstanding warmth to weight ratio. Down is highly compressible which is how full-size sleeping bags, like this one, can pack down to the size of a grapefruit! Down comes in different fill powers. This is a number that indicates the amount cubic inches displaced by a given ounce of down. That sounds really technical but all you really need to know is that the higher the fill power number is the better the insulation is for the same weight. Premium sleeping bags, like those made by Western Mountaineering and Feathered Friends, often use 800 or higher fill power, which means they can stay extremely warm while remaining lightweight and highly packable. Those who want an ultralight bag or plan on backpacking in extreme cold use bags with higher fill powers. However, fill power in the 500-650 range is good enough for most conditions and still provides an awesome warmth to weight ratio. Synthetics are man-made materials used to fill sleeping bags instead of down. While down is loose material, synthetic insulation is usually held together in sheets. The main draw for synthetic insulation is that it is able to retain most of its insulating capabilities even when it gets wet. Whereas down becomes useless when wet and dries very slowly. However, innovators have been continuously working on this issue and there are now down fills treated to be more hydrophobic, that is, they repel water and still provide insulation even if they get a little wet. The effectiveness of these hydrophobically treated down fillings also varies. The outer fabric of down sleeping bags, if waterproof or resistant, can also help to mitigate this issue. There are endless types of synthetic insulation on the market nowadays, with each manufacturer attempting to mimic the quality and benefits of down filling. There are some that get quite close, and Nemo now claims to have matched or beat the leading 650 fill power down bags on the market with the new Azura, Kyan and other sleeping bags. Whether you choose synthetic or down insulation is up to your personal preference and desired activities. If you often find yourself in wet conditions or want to take a canoeing or rafting trip, a down bag may not be the best choice. Likewise, if you’re a car camper and don’t really need to worry about lugging your gear around on backpacking trips, synthetics, being cheaper, may be a wise choice. I myself, prefer down because it lasts longer, and I can use it for backpacking as well as regular camping. I don’t often find myself trapped in very wet conditions either. Though, as a general rule, down sleeping bags are more expensive they don’t have to break the bank. You can find a number of reasonably priced down bags in this article. Or, if you’ve got a bigger budget and are looking for something higher end, read this one. Here’s a TL;DR quick reference table of some general pros and cons although some may be less relevant depending on the specific sleeping bags you’re looking at. Manufacturers have been claiming to have the secret sauce synthetic insulation, to match down filling, for years. So I have to admit that I’m a bit skeptical about the FeatherCore claims. However, Nemo is a great company with cutting edge sleeping bags of all styles and types. I’m eager to look deeper into the new insulation and make up my own mind about the claims. If it truly is as packable, lightweight and effective as down, these synthetic sleeping bags might just be the closest thing to perfect that we’ve ever seen in the sleeping bag market. Taking the pros from the down filling side of the table and combining them with the water resistance of synthetics, it’s an all-around great solution for nearly any situation. And, at around $200 for a 20º sleeping bag, the price is definitely right! Let us know in the comments what you think of Nemo’s recently released insulation. And if you have any questions about anything in this article feel free to drop us a line as well! This is really interesting. I often have this discussion with my wife when it comes to comforters. I love down and prefer to have it as a comforter but she thinks some of the synthetic options might be better. After seeing this I understand that perhaps she may have a point to an extent, but I don’t think anything beats down. I haven’t used a sleeping bag in quite some time but I know that when I go get one next, I am definitely going to be looking for a down one. I am going to have her give your post a read. Thanks again! As far as comforters go I think there are probably great options in both down and synthetic materials. It all comes down to your personal preference. I agree with you in regard to sleeping bags though. I tend to prefer down. Very informative article on synthetic vs down sleeping bags. It is great to know the reasons why synthetic may be better in certain cases. Technology certainly has evolved in this industry when manmade fibers are almost as good a down for insulation purposes. I may never need the higher end sleeping bag myself, but I like to have one of decent quality as I have been caught outside in colder than expected circumstances! I must say that your article is very informative and helpful Mariah. It is great how you describe both pros and cons but honestly, I prefer down. It looks like synthetic is a little better and I guarantee that my wife would agree with you lol. Anyway, you give me something to think about, maybe synthetic bag would be better to have. As I said in the article, it really depends on what you are using it for. I prefer down because I go backpacking and must carry all the gear. The weight adds up so the lighter I can go, the better. However, the new Nemo insulation, if it really is as good as they say, would be superior because not only would it have the same packability and weight of down but it would also be water resistant and possibly cheaper than other sleeping bags of similar specs. These sleeping bags sound great, I have to say that I would traditionally go for down filled sleeping bags but the infohere has made me have a re think. Warmth, comfort and light weight have always been my criteria when considering which sleeping bag to buy. This article is informative and makes me reconsider the options available and think about a synthetic fill as being the better product. If Nemo has indeed achieved an insulation with the weight to warmth ratio of down, then I have to agree with you it is the better product. Hi there, this is an interesting article. I live in the Caribbean so staying warm is certainly not an issue over here lol so I generally look for the thinnest lightest sleeping bag on the few occasions I’ve used one. I’ve lived in the UK though so I certainly understand the need for insulation and warmth in sleeping bags in those climates. You said that down sleeping bags with good care can last long, how many years are you referring to roughly? I am really excited to hear about the new down alternative. I looooove down, but my husband is allergic, as we figured out after about 3 months of breathing at night problems after getting a down comforter. We have always just gone with synthetic on things like this since, but this is super promising! I will definitely have to see how it compares to actual down bags! Or do you think hypoallergenic down (is there even such a thing?) a better alternative? The FeatherCore is promising to be the next big thing! If you’re looking for a synthetic sleeping bag with properties similar to down, I would say go ahead and try it out. There is no hypoallergenic down, but there are hypoallergenic down alternatives. The FeatherCore insulation would fall under that classification as well. When it comes to personal comfort, I think preference is everything. Personally, I’d prefer down of its features but I am afraid I might be allergic to it. Moreover, about the FeatherCore Insulation, I am as skeptical as you are because I doubt if anything can ever match the natural down. It may come close but I don’t think they will get it 100% right. I would love to know what you think about it after you’ve done your research about their claims. If you are allergic to down filling I think you should definitely go with a synthetic bag. Fortunately, there are a lot of synthetic sleeping bags that are very well made and many of them are very well priced. A Nemo sleeping bag with the new FeatherCore insulation would be a great one to try out. And, If you don’t plan to often go backpacking on long trips a synthetic bag could be a superior choice. You can find some recommendations for great, reasonably priced synthetic bags, like the Mountain Hardwear Lamina Z, in this article. Wow, Mariah, what a great post. First of all let me say that I usually don’t read the content, I scan it. Not in your case. I read it all with great pleasure. Very interesting subject, although I must say I will always go for down. I will always go for natural vs synthetic. Tons of useful info: fill power, pros and cons, insulation, standards for down. Many of those thing I did not know. This might be my first of hearing about down, with regards to making sleeping bags and what not. But, from the education offered by your post, I can draw up an opinion and declare my preference. Between the two, I’d go for down. Mostly because it’s natural, and I like to promote nature as much as possible. Not withstanding my love and respect for innovation though. Hi Mariah, thank you for sharing your post on synthetic vs down sleeping bags. I was able to learn a few things about the different kinds of fills. I would think that the down sleeping bag would be better waterproof because the feathers keep the birds dry.>>I now know that when buying my next sleeping bag, to look for one with higher fill power. I do winter camping and would probably need one that is 900 fill power.>>I find it hard to believe you can pack an adult size sleeping bag pack down to the size of a grapefruit. Your line of thinking makes sense but the outer stiff feathers are what keep the birds dry. The downy feathers are the bottom layer of feathers and they don’t get wet because they are protected. Down in its natural state is useless when wet! For winter camping you don’t necessarily need such a high fill power, you can achieve the same warmth with a lower fill power, your sleeping bag will just weigh more. But if you are a winter backpacker and need to carry all your gear with you, higher fill power is better because it will keep the total weight down. If you’re interested in looking at some excellent high fill-power sleeping bags, check out this article: The 6 Best Sleeping Bags for Backpacking – Expert Endorsements. Great article. And the strange thing is that I believe many people do not understand how important it is to use good sleeping bags. At least it is my feeling. I´m from Iceland, and I have used most of my life down from wild Icelandic eider duck which fabulous. The Wild Duck has learned that farmers provide him with protection for predators, but many of them are guarding the nest 24 hours a day. In short, what we usually do is that respect nature, and that gives a lot back. So the treatment of the bird is not a problem at all. Now after many years, I need to buy a new sleeping bag. And I have been looking around with open eyes because the wild ones take a lot of work and because of that, it costs more. And the price is always an important thing. But I don´t know the Synthetics well enough as I have always had down before. I know that it is of course much more weight in it. But is it that much that you feel it on your body? And, because man needs to be careful with the down, is it easy to wash the Synthetics? The price of it got my attention; it is an excellent price. Thank you for a very informative article. Thanks for the personal account of wild down collecting from eider ducks. It’s true that synthetic materials are a lot cheaper. The weight issue is only relevant if you are planning on backpacking or trekking overnight and have to carry your gear. If you only go car camping, that is you are able to drive straight to the campsite, the extra weight is not a problem at all. Synthetic sleeping bags are generally a lot easier to wash than down sleeping bags, as well.